WRM15 dualB-E 100V-15A MPPT charge controller for PV applications with two batteries automatic charge management, Bluetooth connection and Android/iOS APPs to manage and monitor the PV system. 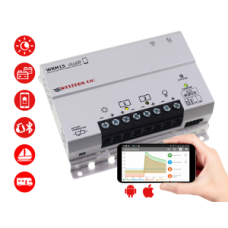 WRM15 dualB is a MPPT charge controller for PV applications with automatic charge management of two batteries, one primary and one secondary. The device uses the Bluetooth interface to connect with Android and iOS mobile devices by the dedicated APP. This is the WRM15 dualB-E version which does not have the load out and the USB port.